My name is Niels Jørgensen and I'm the lead developer on DR9. In this DR9 update I'll talk a bit about a purely visual feature that we added to the DR9 map to make it more interesting to look at. 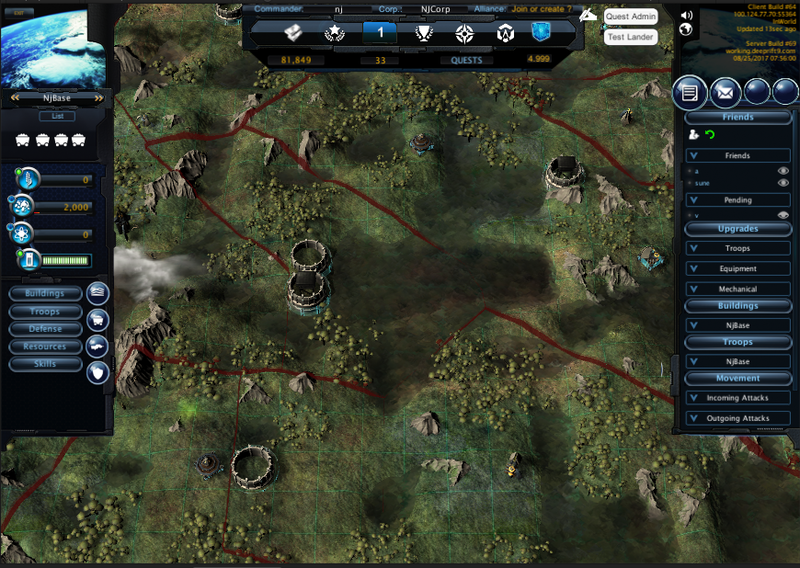 The DR9 world is procedurally generated and needs to be repetitive enough that no specific start location will give a player any huge advantage over another. This means that any given area on the map becomes more or less indistinguishable from any other - as you scroll around, you quickly loose track of what is where. To add insult to injury, player buildings also look the same (with minor variations for building levels, but still). Obviously we can't give thousands of player their own distinct architectural design and since there are no "factions" in the game and alliances are formed ad-hoc, neither of these provide a way to distinguish buildings either. So, in order to provide some visual differentiation and to set areas apart, we decided to render the borders between players. 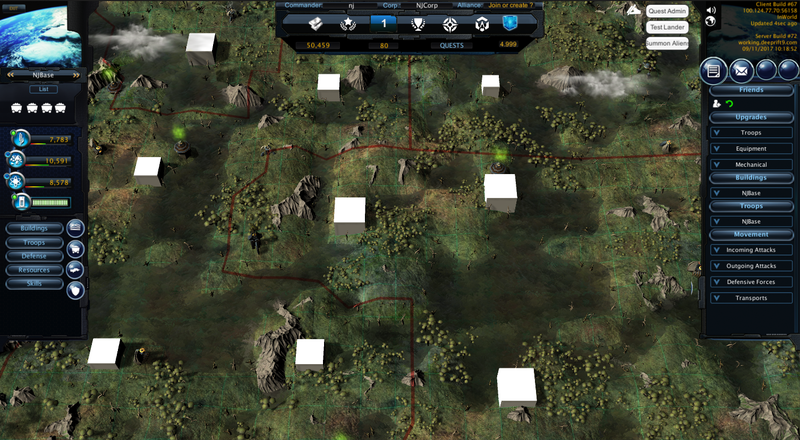 Clearly indicating the size and shape of each players land helps players navigate and makes each area more distinct. It also looks cool :) When the idea first surfaced, it sounded great but also not very easy to implement - at least in any way that was acceptable performance-wise. I did however have this one word in the back of mind that I figured would somehow save me: Voronoi. The TL;DR version: A Voronoi diagram divides a set of seed-points into convex shapes. There is one seed point in each shape and each shape contains all other points that are closer to that specific seed than they are to any other seed point. The edges of the shape naturally becomes the borders to the surrounding shapes. Sounds perfect. My C# adaption is below if anyone feels like saving a few hours of tedious pointer-to-reference conversion. The nature of the algorithm may not need real random access, or my data set may have been skewed in such a way that it didn't - If the searches mostly find candidates in close proximity to where it is, a hashtable has very little use. I did try to shuffle the data but that only pushed the results further in the direction of the non-hashed version, even if only marginally so. 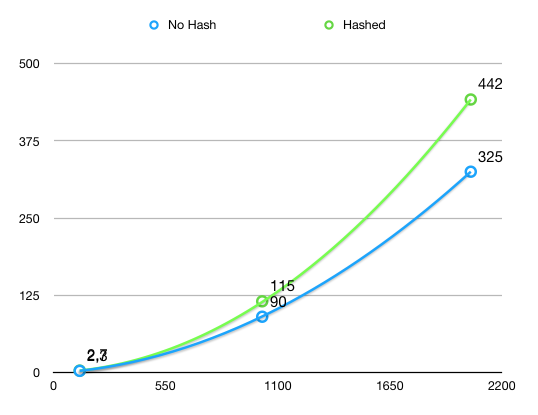 The hash table implementation may have been broken, or using an inappropriate hashing function. I looked at this briefly and it seemed reasonable, using spatial position for hashing which matches the even distribution of my seeds nicely. I didn't do any profiling of the actual buckets to see if the fill was uneven, but I doubt it. The hash table may break optimization done by either the C# compiler or run-time or by the CPU (this could be anything from overflowing the pipeline or missing the cache to fouling up the CPUs branch prediction). Generally, less code, fewer branches, fewer method calls and less messing with shared variables results in better run-time optimization, even if your loops gets a bit longer. Long lesson learned by years of Java programming - you can really mess the hotspot compiler up if you try to be clever on its behalf. 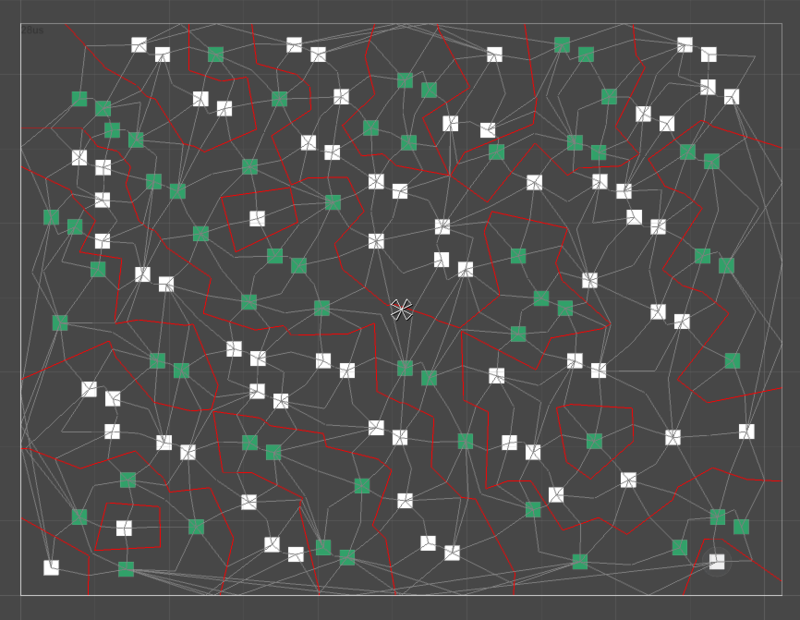 Personally, I have my money on #3 :) In any case, once I had the Voronoi structure, connecting neighbouring shapes with the same owner was trivial, and so was traversing the surrounding edges to create a mesh for the border. 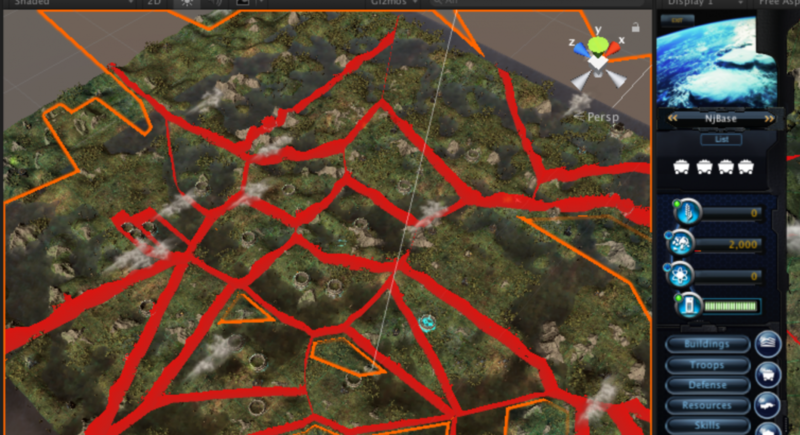 The following screenshot shows borders in red, and lines connecting neighbours in gray. Seeds are considered to have the same owner if they have the same color. My second attempt was to create extruded upside-down U shapes instead of vertical planes. I used the actual procedural height data plus some small distance as the height of the inverted U, but limited to 10 points per edge. This meant that most "real" borders would get subdivided into small enough pieces that they kind of followed the terrain, while the outer ones that extended toward "infinity" would not generate ridiculous amounts of vertices. The problem with this approach was that the border would sometimes extend high above the terrain, and other times penetrate through it, disappearing all together. My C# port is listed below. The way this works is that you create an instance of VoronoidGenerator supplying any class that you want to associate with the seeds - it does not matter what it is, only that you can somehow convert it into a 2D location. You then call AddSeed with each of the seeds you want included and finally Generate to build the actual Graph. Generate takes a locationResolver as its last parameter - this is a function that given a seed of your declared type must return a 2D position. When Generate completes, you can get the first edge in the graph with GetFirstEdge and then loop the graph by following edges (edge.next). Each graph edge contains the border end points as well as a reference to the seeds on either side of the border.